Recognizing the island’s vulnerability to geological and climate change-related hazards and hazards brought about by proliferation of unsustainable and destructive practices, the local government unit (LGU) of Siargao Island focused on developing and strengthening partnerships with the communities, private sector, academia and non-government organizations in order to have a comprehensive knowledge and understanding of the impacts of climate change and to develop and implement adaptation strategies. Theirs is a story of how different sectors worked together to analyze and address the impacts of the different hazards they are facing and how they collaborated to take advantage of an opportunity that resulted in the winning of an 80-million-peso grant for the establishment of a Climate Field School for Farmers and Fisherfolk. 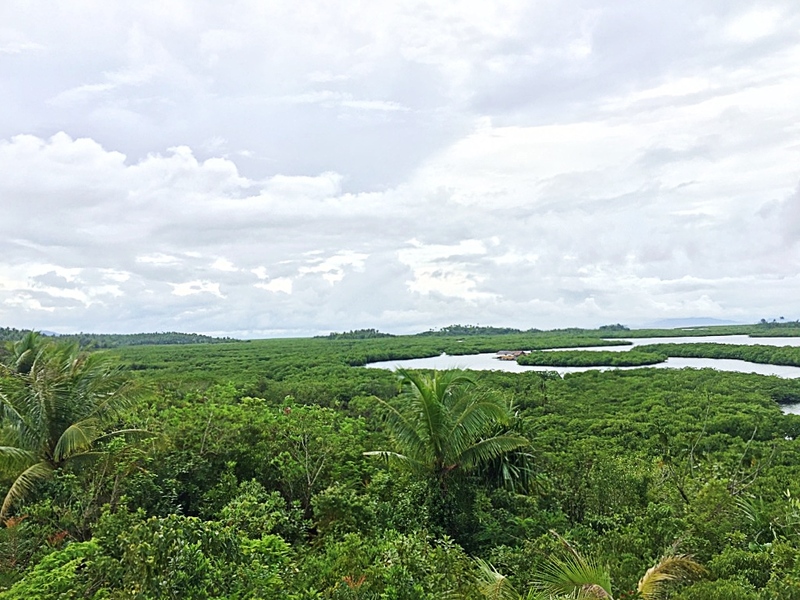 Environment: Illegal fishing and unregulated mangrove cutting was widely practiced in Siargao Island putting their marine resources at risk of depletion. The involvement of fishing communities, the sector most dependent on healthy marine and coastal ecosystem for food and livelihood, was effective in the enforcement of fisheries law and ordinances and in the establishment and strengthening of marine protected areas. The availability of alternative livelihood provided by the LGU, SIKAT and other government agencies also helped curb these illegal practices. Socio-economic: Communities in Siargao Island, many live below the poverty line, are mainly engaged in farming, fishing and tourism, ventures which are all dependent on available natural resources. The awarding of the grant for a climate field school would give the farmers and fishermen the tool to analyze the effect of climate change and adapt their practices. Having the SIPLAS, which identifies the vulnerability of Siargao is the jump-off point by which the stakeholders (local government, non-government, academia and communities were able to identify their adaptation strategy. The second building block ( organizing and building the capacity of people’s organization and identifying partners) is important to ensure that the stakeholders have the capacity to carry out the strategies. The third building block ( educating communities on the hazards of unsustainable fishing practices and climate change) is necessary so that there is a common understanding about why the strategies have been crafted as such. The fourth building block (identifying new partners) ensures that programs are run by partners with relevant experience and capacity. All these blocks are held together by the collaborative relationship among all the stakeholders. Engaging different sectors in the climate change adaptation efforts resulted in a coordinated adaptation strategy which led to the significant decrease in illegal fishing, mangrove cutting and other illegal activities, and increased involvement in environment conservation and protection activities. Through the facilitation of the local government unit, and the support and training provided by SIKAT, a local non-government NGO and a member of the Locally Managed Marine Area (LMMA) Network , the fish wardens and peoples organizations are able to enforce fisheries law, protect the marine protected areas and do information campaign against illegal fishing. Because of the trainings on ecology and marine protected area management, the POs and communities have developed deeper understanding of the different issues on marine conservation and are actively participating in various conservation and protection activities spearheaded by SIKAT and the LGU. The availability of alternative livelihood opportunities also made the PO members less dependent on fishing and diversified income sources. All these resulted in a significant decrease in illegal fishing activities. Multi-sectoral engagement also enabled the local government unit to secure significant funding from the national government to set up the Siargao Climate Field School For Farmers and Fishermen. Multi-sectoral climate change impact requires multi-sectoral approach. As climate change will most likely lead to significant changes in different areas of life, one sector, not even the government can single-handedly manage the impacts. Diverse perspectives from different experts coming from different sectors are required for a comprehensive analysis of the impacts and to develop appropriate adaptation strategies. That was the approach that Siargao Island has taken. Siargao has become an arena for collaborative partnerships around the area of climate change. In 2011, Del Carmen municipality piloted the establishment of a model climate change resilient community in cooperation with the Climate Change Commission. They have developed their climate change adaptation plan which included banning of all destructive fishing gears, establishment and strengthening of marine protected areas, and reduction of fishing effort through the introduction of alternative livelihood. In partnership with NGOs, fish wardens were organized to enforce the fisheries laws and ordinances and people’s organizations created and trained for alternative livelihood and for community-based tourism. The Center for the Development of Indigenous Science and Technology or locally known as SIKAT, a non government organization and a member of Locally Managed Marine Area (LMMA) Network trained and supported the peoples organizations on community based Coastal Resource Management. When the People's Survival Fund (PSF) was passed into law in 2012 to finance climate change adaptation strategies of LGUs, Del Carmen collaborated with the NGOs and Surigao State College of Technology (SSCT) to draft the proposal. The proposal was for an 80-million peso fund for setting up of the Siargao Climate Field School for Farmers and Fisherfolk and was prepared after community consultations and tincludes inputs from fishermen, farmers, NGOs and LGU. The proposal was one of the first 4 approved by the Climate Change Commission for the PSF. Jonathan, SSCT Administrator was excited to find out: "How many of the students would share their knowledge with their parents who are farmers or fishermen? Would this pave the way for them to have a better life? Who wouldn’t be inspired once you see them improve their lives because of what they will be learning in school?”. This solution is published in the Protected areas, Marine and coastal and Ecosystem-based Adaptation portal.